New data suggest there was a steep rise in youth vaping between 2017 and 2018. FDA/CDC rushed out a partial disclosure of the 2018 National Youth Tobacco Survey (NYTS). I took a hard look at the partial disclosure of the NYTS survey data here: More heat than light – new US statistics on youth vaping provide no basis for FDA policy (November 2018). The basic issue is that you have to know more about: (1) who is a regular vaper; (2) what the regular vapers would be doing in the absence of vaping; (3) who is using nicotine. That data is not available at this time but we know enough to be sceptical. However, these data have prompted a very strong response from FDA Commissioner, Scott Gottlieb. He has defined the rise in youth vaping as an ‘epidemic’ and says that this poses an ‘existential threat’ to the category. The threat, it should be clear, is made by Dr Gottlieb in his capacity as a regulator and is based on his analysis of what the headline trends mean, and the options FDA has to respond. I will use this post to show why I do not believe his analysis is sufficient to justify ANY of the actions he is threatening. 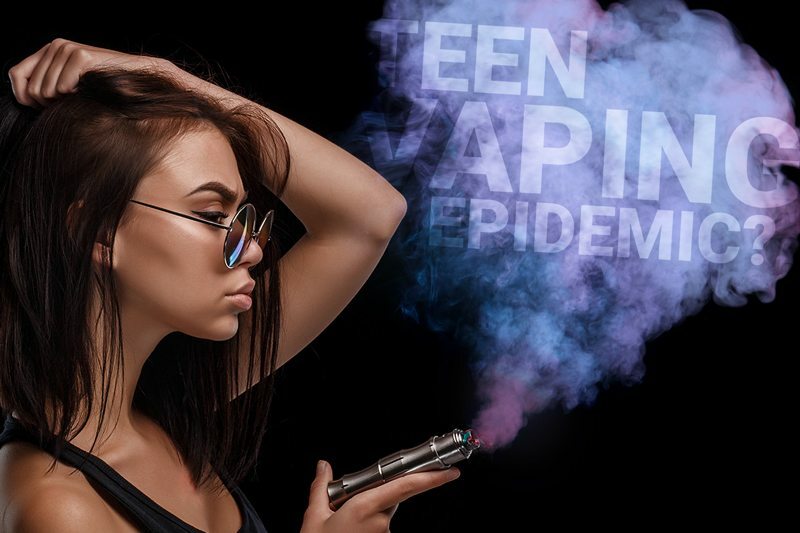 In September 2018, FDA was jolted into action by the (at the time undisclosed) news of a rise in teen vaping. Since April, FDA had been captivated by an activist campaign and dozens of critical news reports focussed on the highly successful Juul vaping product. But the data was being treated uncritically. See my blog: The US media is losing its mind over vaping and Juul – the questions a credible journalist should ask. Alas, there has not been a more careful examination of the data or how it should be interpreted. If anything, the hype and panic has intensified. We didn’t predict what I now believe is an epidemic of e-cigarette use among teenagers. Today we can see that this epidemic of addiction was emerging when we first announced our plan last summer. Hindsight, and the data now available to us, reveal these trends. And the impact is clearly apparent to the FDA. I use the word epidemic with great care. E-cigs have become an almost ubiquitous ‒ and dangerous ‒ trend among teens. U.S. Surgeon General Vice Adm. Jerome M. Adams issued an ‘advisory’ today stressing the importance of protecting children from a lifetime of nicotine addiction and associated health risks by immediately addressing the epidemic of youth e-cigarette use. E-cigarette use among youth has skyrocketed in the past year at a rate of epidemic proportions. Dr Gottlieb reaches for “epidemic of addiction” as the basis of his epidemic claim, and says he uses it ‘with great care’. But it is a gigantic and inappropriate conflation to equate a rise in teenage vaping with a rise in ‘nicotine addiction’, as we shall see. American Psychiatric Association, What is Addiction? When people talk about addiction, they are usually referring to the harmful behavior associated with substance abuse. Dependence refers to the physical symptoms of withdrawal and tolerance. But even if we allow sloppy interchangeability of addiction and dependence, how many teen vapers meet the criteria for nicotine dependence? Many experts stress the ‘time to first cigarette’ as an indicator of nicotine dependence. Thus the time-to-first-cigarette item appears to tap a pattern of heavy, uninterrupted, and automatic smoking and may be a good single-item measure of nicotine dependence. The famous Fagerström Test for Nicotine Dependence includes time-to-first-cigarette in its index. However, this widely-used index scores zero for those having their first cigarette later than one hour from waking. This isn’t even daily use, but a subset of daily users who feel a strong compulsion to smoke soon after ending their overnight abstinence. How many teenage vapers are having their first vape within an hour of waking? Nicotine is the primary psychoactive substance in tobacco smoke or e-cigarette aerosol. But the dependence-forming characteristic of nicotine is strengthened by interactions with other substances present in cigarette smoke, for example, monoamine oxidase inhibitors (MAOIs). Nicotine is the major neuroactive compound of tobacco, which has, by itself, weak reinforcing properties. It is known that levels of the enzymes monoamine oxidase A (MAO-A) and MAO-B are reduced in the platelets and brains of smokers and that substances, other than nicotine, present in tobacco smoke have MAO-inhibitory activities. Here, we report that inhibition of MAO dramatically and specifically increases the motivation to self-administer nicotine in rats. Guillem K, Vouillac C, Azar MR, Parsons LH, Koob GF, Cador M, et al. Monoamine Oxidase Inhibition Dramatically Increases the Motivation to Self-Administer Nicotine in Rats. J Neurosci. 2005 Sep 21;25(38):8593–600. [link] emphasis added. There is no evidence that vape aerosol contains MAOIs, such as β-carboline alkaloids found in cigarette smoke. These results suggest that β-carboline alkaloids from cigarette smoke acting as potent reversible inhibitors of MAO enzymes may contribute to the MAO-reduced activity produced by tobacco smoke in smokers. What then is the basis for treating all nicotine use as if it is equally reinforcing, dependence-forming and addictive? Scott Gottlieb draws on anecdotal evidence to support his concerns about nicotine addiction, though he does not document any of it. But, already, I’ve heard too many painful stories from parents of teenagers, pediatricians, and young people themselves. The stories make clear that, for many young e-cigarette users, addiction has already taken hold. Perhaps the kids didn’t realize that what they were inhaling contained nicotine, a highly addictive chemical. For these addicted young people, the reasons that they tried e-cigarettes may not matter anymore. These young people are hooked on vaping, and their worried parents, physicians, and the public health community are searching for tools to help them quit. Obviously, it is wholly unscientific to approach the impact of vaping in this way. The use of second- or third-hand accounts with no knowledge of the cases or on what basis they are classified as addicted, or what proportion of users are in the ‘hooked’ category does not contribute meaningful information to the debate. But it does suggest that emotively charged terms are being used uncritically, and perhaps politically. Regrettably, the Surgeon General has also reported third-hand anecdotes as if they are useful contributions to the debate – much to my dismay. There are plenty of reasons why senior public health officials would hear only the most extreme cases, and that those involved in relaying such cases would exaggerate or distort the cases – many of their interlocutors are engaged in a political campaign to use FDA regulation to apply a da facto ban to vaping. Selection bias and confirmation bias are everpresent dangers here. We don’t know how much adolescent vaping meets these criteria – I suspect only a tiny fraction if any. But neither does Scott Gottlieb nor the Surgeon General, Jerome Adams. Yet they are the ones making the claims and shaping public policy on the back of them. The available data come nowhere close to providing an adequate basis for these claims – and could even support the case that adolescent vaping is beneficial to public health. But if we look at what we do know, the picture is far from nightmare portrayed in the press and by public health officials. Let’s try to inject the facts we do have into the discussion. Those using e-cigs only a few times a month are doing something much less concerning – just messing about, experimenting etc. We don’t know exactly how many because CDC/FDA has only published one data point for the 2018 frequency of use distribution: of those who vaped at least once in the last 30 days, only 27.7% did this on more than 20 days. This suggests the large majority (>70%) are not ‘substance users’ but have a more experimental or frivolous pattern of use – blowing clouds etc. Given that 20.8% of high school students had vaped in the past 30 days, that means only 5.8% of high school students are regular or daily users (≥ 20 day). Daily use for 2018 was not disclosed. However, for 2015-17, 70% of regular users (≥20 days) were daily users. Applying this proportion to the 2018 data would suggest about 4% of high school students are daily users (this compares to the headline 20.8% use in the past 30-days). Of course, we don’t have any data on how many adolescents are vaping within one hour of waking, but it will likely be a small subset of the daily users. Potentially problematic use is a small subset of the headline numbers. But the analysis does not stop there. What would this group of regular or daily users be doing instead of vaping if e-cigarettes did not exist? Needless to say, that data has not been disclosed. The data we do have strongly suggest that many of these more regular users would be smoking. If these frequent-cig users are mostly already smokers or likely to become smokers, then this may be the start of them switching away from smoking – and therefore it could be beneficial for public health (and we have seen rapid declines in adolescent smoking as vaping has risen). From previous studies, we know that frequent vaping is almost entirely concentrated in young people who smoke or use other tobacco products. Less than one in one thousand young people had become frequent vapers having never used tobacco before. And even in these cases, we do not know what this tiny minority would have done in the absence of e-cigarettes – possibly gone on to smoke. Few never tobacco users had used e-cigarettes on 10 or more days in the past month (absolute percent < 0.1%). The problem is that we don’t have these figures for 2018 – when the Juul effect starts to be felt. We need to know both the frequency distribution AND the tobacco use for each frequency increment to make sense of what is really going on. FDA draws attention to the rising share of frequent users: The share making frequent use (≥20 days per month) has been rising, 16.5% in 2014 (here), 2015-17 average 17.4% (here), 20.0% in 2017 and rising sharply to 27.7% in 2018 (here). But this might actually be good news: that more dependent young smokers are turning to vaping. Most of the youth e-cigarette use is probably not nicotine based… again the main National Youth Tobacco Use Survey doesn’t actually even ask if the vaping is nicotine-based, yet still counts it as “tobacco use”. But if we look at the University of Michigan Monitoring the Future survey we can get some idea – at least what the adolescents actually report. This letter in the NEJM with data from the University of Michigan Monitoring the Future survey gave the youth vapers reporting using nicotine in the past 30 days as 84% of the total (Table 1). A common assumption among researchers and policymakers is that adolescents are vaping nicotine, although this assumption has yet to be examined closely. Among students who had ever used a vaporiser, 65–66% last used ‘just flavouring’ in 12th, in 10th and in 8th grade, more than all other responses combined. Correction: this section was updated 22 January. There has been a substantial increase in either those using nicotine or those realising they were using nicotine. But there is still vaping without nicotine incorrectly counted as tobacco or nicotine use in ‘epidemic’ claims. Despite the moral panic about vaping in the United States, the current use of marijuana was almost one in five 19.8% in 2017 among high school students. In 2018 e-cigarette use was 20.8%. It is quite possible that some of the increase in vaping arises from adolescents vaping cannabinoids instead of smoking. Though one would not wish to condone this, it is better to vape than to smoke – whatever the substance. However, such an effect would exaggerate the rise in vaping. It could simply represent a change in the way young people take marijuana. CDC/FDA approach vaping as if it is a tobacco use behaviour, but that is an invalid assumption: some vaping involves no nicotine, some involves other substances. The Surgeon General has made a strong claim about nicotine and the developing brain. I absolutely want people to understand that for young people, this presents a very unique danger. … Nicotine is uniquely harmful to the young, developing brain. We know that the brain continues to develop up to the age of 25. For the developing brain, [nicotine] can cause learning, attention and memory problems and it can prime the brain for future addiction. A unique danger? Uniquely harmful? Really? More harmful than cannabis, alcohol, crystal meth, fentanyl? More harmful than American football? Worse than a car crash? Obviously, it is inappropriate to make wild claims like that nicotine is uniquely harmful. But what of the more modest claim that young people’s brains are harmed by nicotine? Where would you look for evidence? How about all those young people who have been exposed to nicotine as smokers? There are millions of them happily pursuing adult life: but are they suffering any form of damage? 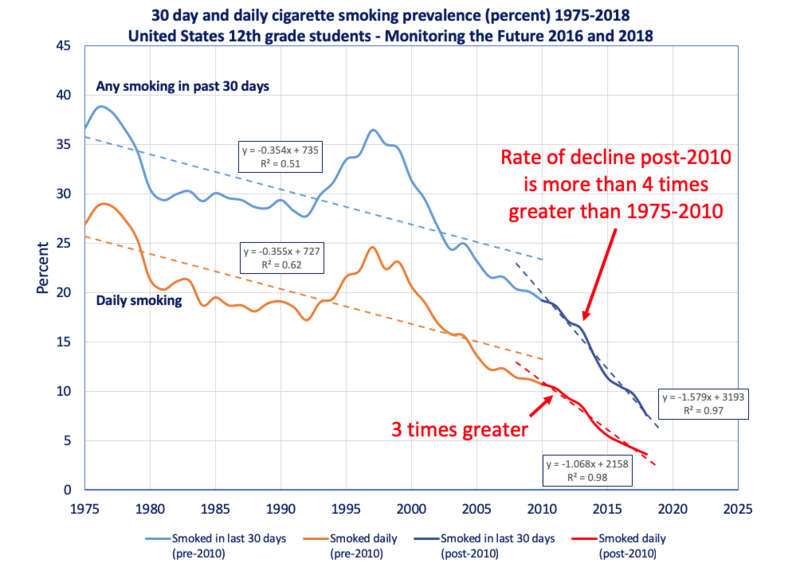 In 1980, 30.5% of US 12th graders were past-30-day smokers, 21.3% daily smokers [Monitoring the Future]. This group would be in their 50s by now, and most would have quit smoking years ago. Where is the evidence of impairment in this population arising from youth nicotine use? Limited direct human experimental data exist on the effects of nicotine exposure from e‑cigarettes on the developing adolescent brain, but experimental laboratory data have been found to be relevant in animal models to contextualize effects in humans. The possible harms to youth of nicotine cited by Flannery are based primarily on animal studies. While concerning, direct causal evidence is sparse from human studies that can quantify nicotine’s harms or benefits. Our framework is agnostic to benefits or harms if they can be quantified beyond speculation and weighed against the well-known harms of nicotine when delivered in smoked tobacco with carbon monoxide and its toxins. The appropriate comparison is not between the adult and the adolescent brain, but the effects of different things that young people do have on the developing brain and whether these effects are harmful in some way. I am unaware of evidence suggesting that nicotine “can cause learning, attention and memory problems” in young people. Please advise. Our framework allows for additional harms informed by science and recognizes potential benefits of nicotine use in adults (e.g., increased alertness, concentration, memory, and modulating mood) (Heishman et al., 2010; Newhouse, 2018; Talati et al., 2016). The Youth Risk Behavior Surveillance system provides some insight into the risks that young people take. So 29.8% of high school students are using alcohol, and 13.5% “binge drinking” (according to CDC’s definition) but 20.8% vape. There are about as many marijuana users as vapers. What is the response to that? If there are any material risks with vaping, they would arise from decades of use, and only if the vaping becomes a smoking habit that would not otherwise have happened. Alcohol use, in contrast, can end a life instantly, pulverised in a road traffic accident, or put young people into violent, abusive or vulnerable situations that can be acutely harmful. These differences in structure and function are related to poorer neurocognitive performance on tests of attention, working memory, spatial functioning, verbal and visual memory, and executive functioning. Adolescents who engage in heavy episodic drinking (binge drinking), as well as those who have greater withdrawal and hangover symptoms, tend to show the greatest deviations in functioning. Family history of alcohol is related to cognitive disadvantages that may leave youth more vulnerable to the neurotoxic effects of alcohol use. Dr. Gottlieb is quick to attribute the youth vaping epidemic to ‘flavors’. And quick to determine that taking them off the market would roll back the epidemic. Far too quick. I find myself debating with tobacco makers and retailers the merits of selling fruity flavors in ways that remain easily accessible to kids. 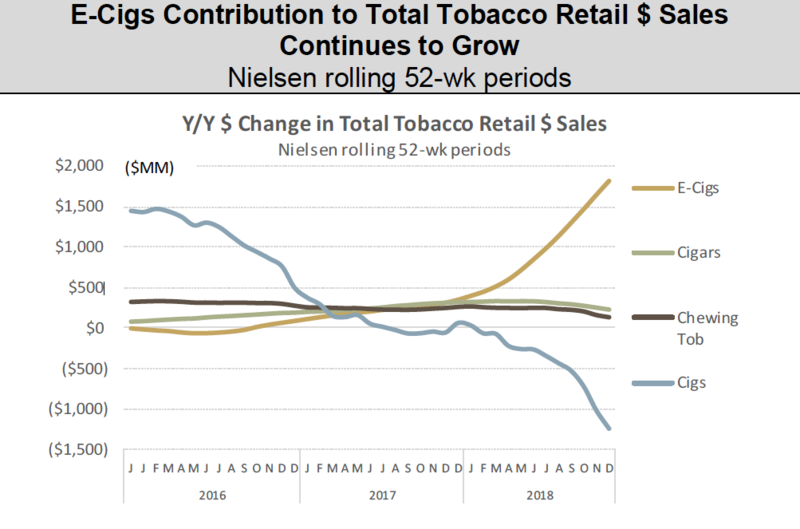 But if the epidemic continues to mount, I’m sure that the debate will change to one of whether these products should continue to be marketed at all without authorized pre-market tobacco applications. In doing so he misses much subtlety about how flavours and product appeal actually work in public health terms – for both adults and adolescents. Many of us have tried to explain it, but apparently without success. If it can be shown that certain flavours change behaviour, it is quite possible that change will be beneficial – an attraction away from smoking. (1) the effects of vaping on health, and (2) the effect of flavors on vaping. FDA would need to show that vaping itself is a source of net harm (this is unlikely) and show that particular flavors or descriptors were increasing uptake and contributing to harm (this is difficult). Finally, it would need to show its proposed intervention would be proportionate and effective, and not prone to excessive unintended consequences (for this there is no credible evidence). The FDA does not have a reliable case at any point in this chain of reasoning. The absurdity of this approach reached a peak in November 2018, when FDA decided to remove flavoured e-cigarettes from convenience stores and allow them only to be sold in age-restricted locations. The changes I seek would protect kids by having all flavored ENDS products (other than tobacco, mint and menthol flavors or non-flavored products) sold in age-restricted, in-person locations and, if sold online, under heightened practices for age verification. So cigarettes were unaffected, and the only vapes allowed were those most like cigarettes. FDA has completely lost track of what it is doing and why. AG Miller also highlighted the obvious absurdity of leaving only those products which most closely resemble cigarettes on the market. almost exclusively tobacco and menthol flavors. There is no obvious logic to restricting e-liquid flavors to only those that mimic the most dangerous tobacco products and have been the main basis for initiation in the past – and no justification of such a move has been provided. But nowhere in the Act is a false equivalence created between, for example, dying in agony from cancer or the debilitating misery of COPD and adolescent vaping, which is, objectively, a low-risk behaviour with minimal health consequences. Quitting smoking by switching to vaping is a huge benefit to a smoker. Starting to vape causes negligible harm to an adolescent – and even those vaping regularly may be doing it as an alternative to smoking, in which case it is a benefit. On top of this, Dr Gottlieb is bizarrely indifferent to the effect that vaping might have on youth smoking. He is not prepared to countenance the idea that e-cigarettes may reduce youth smoking, even if this was proven. He rules this out on principle. No child should use any tobacco product. We’ve seen cigarette use decline among kids, while e-cig use has grown sharply. This is happening even as overall rates of tobacco use among kids has declined, according to recent data. This is still not acceptable, even if the trends are moving in a more positive direction of reduced overall use of tobacco products. Even if kids are using ENDS instead of cigarettes — and that migration in part accounts for the decline in youth cigarette use — that’s still not an acceptable trade. Parents who see their children using e-cigs and say, “well at least my child isn’t smoking,” should take no comfort. No child should be using any tobacco product. Actually, parents should take a great deal of comfort – smoking is the actually harmful behaviour. They should equally be concerned if Dr Gottlieb’s misguided ethics stop them vaping instead of smoking and so causes them harm. Public health does not work by declaring that “No child should do …X” and then expecting that to happen. It is about intervening in real-world behaviours, where appropriate, to improve public health. Parental smoking and adult role-modelling are important risk-factors and predictors for youth smoking initiation. By modelling a different, far less harmful behavior, adult vaping and associated smoking cessation is likely to have a beneficial effect on youth smoking initiation and prevalence. The loss of a parent or close relative to smoking-related disease is a significant detriment to most young people. Likewise, adult ill-health imposes costs on the family in terms of lost economic activity and increased caring responsibilities. Harm reduction for adults has collateral benefits for a whole family, including its younger members. Adolescents grow into adults, and today’s youth have an interest, not necessarily acknowledged, in having better options for their future.The serious harms of tobacco or nicotine use are not instantaneous and mainly develop over many decades of use. They are an outcome of the pattern of tobacco use over the life-course – almost all of the premature mortality risk of smoking is avoided by stopping smoking by age 35. So, opportunities to stop smoking in the first two decades of adult life are especially valuable and continue through the whole life-course. FDA officials like Mitch Zeller have been calling for a debate about nicotine. For example, Zeller posed six questions. How comfortable are we with long-term, or possibly permanent, use of less harmful nicotine delivery mechanisms by adults, if they help keep currently addicted smokers from relapsing to combustible tobacco products? How much weight should be placed on diminished interest in quitting nicotine altogether? Given the potential health impacts of dual use of tobacco, how acceptable is a short period of dual use while transitioning to less harmful nicotine-containing products? What if many current smokers engage in dual use on a long-term or permanent basis? Can we revise labeling and indications for medicinal nicotine to increase quitting? How might youth initiation be affected by the availability of different nicotine-containing products and how should we account for youth uptake of these products? Good questions – and I provided my answers: Rethinking nicotine: FDA asks six questions about the future of nicotine regulation. So did Brad Rodu, but with some scepticism that anyone cared to hear the answers: The Answers to FDA’s Tobacco Questions Are Obvious, But Perhaps Unwanted. My view in brief: we are a drug-using society, and nicotine – delivered without smoke – is a relatively benign drug. Efforts to stop people using nicotine run counter to efforts to reduce their exposure to smoke. The government should not be intervening to obstruct much safer alternatives to smoking while allowing cigarettes to be ubiquitously available. So when is this debate about rethinking nicotine actually going to happen? Or is it just a diversionary tactic to look serious without being serious? At the moment we have FDA and the Surgeon General taking to social media with slogans that appear to have been copied from the playbook of activist organisations. That is not the debate we need now. FDA, CDC and the Surgeon General have lost sight of the most important fact in tobacco policy. To paraphrase Bill Clinton: “it’s the smoke,stupid“. Yet all have become obsessed with the ‘threat’ from much safer alternatives to smoking, such as vaping. FDA is hardly doing anything to address the 2.3 million teens still using combustible tobacco products (CDC, 2017). FDA has a “Youth Tobacco Prevention Plan” but it is entirely focussed on e-cigarettes [statement] and not on the actually harmful tobacco products, cigarettes. FDA is insisting that e-cigarette products are sold under more restrictive conditions than cigarettes: all flavoured ENDS products (other than tobacco, mint and menthol flavours sold in age-restricted, in-person locations [announcement, October 2018]. In fairness, FDA is proposing to ban menthol in cigarettes – but flavours are integral to the e-cigarette value proposition. FDA made extremely demanding disclosure requests of vaping businesses. For example, to Juul and others. No equivalent curiosity was shown about the cigarette businesses and preventing youth smoking. FDA issued letters to five manufacturers asking each company to “submit within 60 days plans describing how they will address the widespread youth access and use of their products”. No equivalent demands have been made of cigarette businesses and youth smoking. FDA has focussed its Real Cost campaign on vaping. For example, at the time of writing, its Facebook page and YouTube channel are dominated by anti-scientific fear-based advertising about vaping. Smoking, the actual public health issue, is barely mentioned. The Office of the Surgeon General has released a 2016 report and a new advisory raising alarm about e-cigarettes. But the SG has done nothing to put these risks into context with smoking-related risks. FDA proposed a rule that would take most smokeless tobacco products off the market by setting a nitrosamine standard that is impossible to meet for most products. The standard was not applied to the tobacco in cigarettes. FDA, CDC and the Surgeon General have done almost nothing to correct wildly inaccurate public perceptions of the relative risk of combustible and non-combustible tobacco products. Only 2.3% of Americans think (correctly) that e-cigarettes are much less harmful than cigarettes [link]; Only 13.4% believe smokeless tobacco is less harmful than cigarettes (it is much less harmful)[link]; over 50% believe nicotine causes most of the cancers caused by smoking and only 8% correctly strongly disagree that nicotine is the main cause [link]. In fact, the focus on vaping and demonising nicotine has been pushing the vaping and nicotine perceptions in the wrong direction. Yes, they have been making a bad situation worse. FDA has yet to issue a single Modified Risk Order, even though it is beyond dispute that smokeless tobacco and vaping products are much less harmful than cigarettes. The effect is to protect cigarettes from competition on the basis of health differential – a key USP of non-combustible products. See MRTP application stats. The cost of even applying to state the obvious runs to millions of dollars and given FDA’s intransigence, the cost is a clear deterrent to even trying. This the FDA’s response to the most promising innovation in several decades to address the ‘epidemic’ of smoking-related disease is to define it as a threat, overstate or misinterpret its risks and ignore its potential – smothering it with bureaucracy, opaque procedures and hostile propaganda. They are truly the enemies of innovation. If the public health task is to change behaviours that cause the greatest harm, that would be smoking, then we really are winning. There was a substantial increase in youth vaping prevalence beginning in about 2014. Time trend analyses showed that the decline in past 30-day smoking prevalence accelerated by two to four times after 2014. Indicators of more established smoking rates, including the proportion of daily smokers among past 30-day smokers, also decreased more rapidly as vaping became more prevalent. Note that this is not the trade-off acknowledged by Dr Gottlieb between the ‘on-ramp’ to vaping for youth and ‘off-ramp’ from smoking for adults. This is vaping displacing smoking among youth. The obvious corollary is that measures to limit youth vaping uptake could have adverse unintended consequences, and cause a rise in youth smoking. At the very minimum, FDA should recognise this possibility and incorporate it into any assessment of the public health impact. The adult trend (above) is extremely encouraging. Adult smoking cessation provides the most rapid health gains and healthcare system benefits. 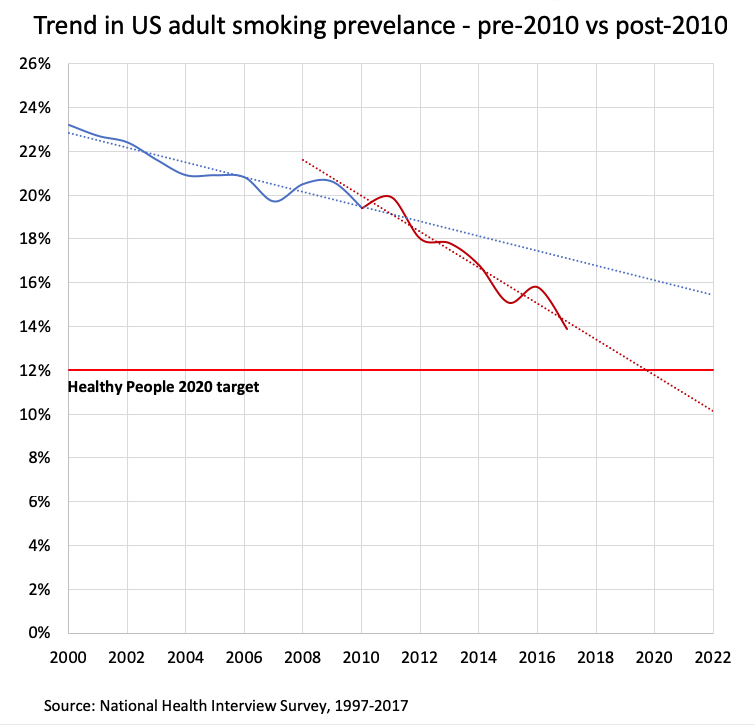 In the age of vaping, the US has got back on track to meet its Healthy People target to reduce smoking to 12% by 2020. There may be many causes of the improving trend, but it is hard to argue that vaping is creating a public health disaster. It is clear that vaping products are having a profound impact on the market for recreational nicotine, currently dominated by smoking. The tobacco majors have seen their stock value savaged as investors project forward the impacts of profound shifts in consumer preferences for nicotine – the migration from harmful combustion products to much less harmful vapour or smokeless products. On 24 January, Altria hit a new 52-week low and is down 37% in the past year. BAT is now down by over 53% in that time. Even PMI is down by about a third. Something big is happening! The question is: does the investor in the cigarette business have a friend or foe in the FDA, Surgeon General and activist groups like Campaign for Tobacco-Free Kids? From where I sit, the champions of public health look like they are striving hard to hold back the transformational innovations that will alter the tobacco and nicotine market permanently and for common good. Big Tobacco’s Little Helpers, as my friend David Sweanor memorably put it. The gateway effect, whereby a less risky behaviour causes the initiation of a more risky behaviour, has a disreputable history with origins in the ‘reefer madness’ moral panic about cannabis. Its primary function is as an activist talking point that contrives to load relatively benign behaviours or drugs with the risks and harms of more harmful behaviours or drugs: thus cannabis becomes as harmful as heroin and, currently, vaping becomes as harmful as smoking. I mention this because Dr. Gottlieb has been suggesting that vaping may cause smoking. … the PATH Study data are observational; we cannot establish causal relations or rule out the possibility of residual confounding by underlying risk-taking propensities. This is at the heart of the intractable problem with gateway claims. It is impossible to eliminate “underlying risk-taking propensities” as the reason for an observed association between vaping and subsequent smoking. This means people might have an underlying tendency to indulge in risky behaviours and both the low-risk and the high-risk behaviour might be attributable to this. That is quite likely given that vaping is a ‘smoking-like’ behaviour – though at dramatically lower risk. This is known as ‘confounding’. But what it means is that without the existence of vaping these young people may have gone on to smoke anyway, and therefore that vaping is not the cause of their smoking. The investigators were unable to report a single youth out of the 12,000 in the sample who was a cigarette naive, regular vaper at baseline who progressed to become a smoker at follow-up. Why? Because the number of these youth was so small that it was impossible to accurately quantify this number. By the way he says that even for the 21 that started vaping and then moved on to cigarettes vaping may not have been gateway. This is because in a hypothetical world (‘the counterfactual’) they may have become smokers anyway. Didn’t the National Academies say there was a gateway effect? There is substantial evidence that e-cigarette use increases risk of ever using combustible tobacco cigarettes among youth and young adults. National Academies of Sciences, Engineering, and Medicine. 2018. Public health consequences of e-cigarettes. Washington, DC: The National Academies Press. [link]. 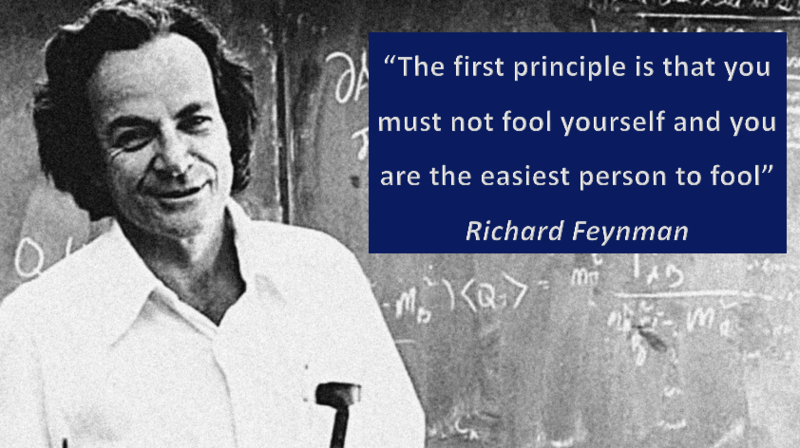 “Ever-use” is not in itself a problem behaviour – it more an indication of a tendency to experimentation. The problem behaviour is sustained regular use. While ever-use is a necessary step to sustained regular use, it is far from sufficient – most experimenters will not become ‘addicts’. Use of ever-use draws in a huge population ‘froth’ of teens who are not at risk and are just messing about. The challenge of deconfounding is further exacerbated by the focus on ‘ever use’ This because ever-use is a different behaviour to sustained and has different underlying drivers to regular use. It would require different deconfounding variables to eliminate common risk factors – variables that reflect the propensity to experiment or goof about, rather than variable that reflect the propensity to use tobacco more intensively – a form of substance use. NASEM recognises gateways in both directions – a catalytic effect in which vaping causes smoking and a diversion effect in which vaping prevents smoking. But its conclusion rests only on looking at transitions from vaping to smoking: “Removal of baseline ever smokers from the analyses is critical for eliminating the possibility of reverse causation“. By this, NASEM means that some e-cigarette use might be caused by smoking (for example, people trying to quit smoking) – it doesn’t eliminate reverse causation because that is a real-world effect. It simply ignores it in the analysis. Any assessment of the impact of e-cigarettes on young people needs to make a net assessment of all the possible transitions (harmful and beneficial), not just look at one pathway in isolation (note this is nothing to do with adults – it is about whether young people may be benefiting). Claiming a gateway effect is meaningless without quantification. It is a near-certainty that at least one e-cigarette user will have become a smoker because of vaping. But how many would it take before it was of public health relevance? For further views: National Academies report – just what the FDA ordered and Does vaping lead to smoking? by Carl V. Phillips. No clear provenance exists and its origin appears to derive from lay, academic and political models. It is apparent that discussions about the natural progression of drug use observed in longitudinal studies of young people appear to have morphed into implicit conclusions on causality without any evidential backing. Please use comments to suggest improvements or further talking points and I will add them to this list. 29 comments to The great American youth vaping epidemic. Really? It seems quite clear to me that Gottlieb has been compromised, probably by a substantial bribe; the likeliest source of money that substantial is Big Pharma. Nevermind the president, we all know he’s a criminal — why can’t we inspect the finances of ANYONE who wants to “regulate” things that aren’t harmful? Anyone who wants to regulate something as beneficial as vaping right out of existence, has QUITE OBVIOUSLY been BRIBED. found that just 15% of US teens who smoked a cigarette in the past 30 days in 2015/16 reported that an e-cigarette was their first tobacco product used, but 71% reported cigarettes was their first tobacco product, and 13% reported first using an OTP. So while FDA’s Scott Gottlieb touted this study as finding that e-cigs lead to cigarette use, he (just like the study’s authors) failed to reveal that e-cigs did NOT lead to cigarette smoking among 85% of teen smokers. An incredible piece of work here Mr Bates! I wish I was more eloquent in describing this amazing post, but I will just leave it at Bravo! Great analysis. Thanks. You highlight the weak points of the “epidemic” scare. A discussion is still missing on the “why”, i.e. why is the FDA (and mainstream tobacco control in the USA) are just now reacting in this quasi-hysterical manner? Notice that this “epidemic” scare has been confined to the USA, it has not spread even to Canada, a culturally similar country but having a thoroughly different set of Public Health policies. My two cents: the Juul is victim of its great success. It is the first product in the USA market endowed with realistic potential of phasing out cigarettes, but phasing out cigarettes implies in the long run phasing out tobacco control. Here by “phasing out” I don’t mean immediately termination, it is a slow process likely leading to a long term 5% remnant cigarette smoking prevalence (which tobacco control pundits identify with the “end game”). In such scenario, a massive tobacco control machinery is clearly redundant (bye bye MSA money, juicy NIH grants, hefty contributions to Truth Initiative, CTFK and similar charities, pharma alliances, etc). To prevent this, vaping (specially Juul usage) must be exhibited as a health threat comparable to smoking via nicotine addiction of youth, as it hard to argue that it is comparably toxic. I believe this is the underlying reality behind the events: a perfect storm mixing ignorance, fear and corruption. Cynics would probably be maneuvering this in a conspiratorial manner (prevent at all costs the end of the gravy train), but not ideologues, for them vaping is just a novel form of smoking, and thus it must be subjected to the same phasing out, or at the very least kept without its “fun” and recreational features (flavors, designs, etc) as a sort of over the counter “smoking cessation kit” (a sort of NRT v 2.0). Let’s face it, the FDA is only looking at this one sided, and that is it… We all know it will not be long any tobacco product sold you will have to be 21 years of age. Retail stores are always check to see if they are selling any tobacco product to anyone under age and they score very well in not making the sale. A lot more has to be put into this other than just the FDA making a one sided review on what to do with E cigs. 1. Smokers who stop before 35 have mortality rates identical to never-smokers. 2. Unhealthy vapor constituents will certainly be identified and eliminated within 2 decades. 3. Nicotine itself is quite safe https://bit.ly/2B1Igxt. Perhaps you could give more emphasis re how the the marked decline in actual sales of combustible cigs maps ,almost mirror perfectly to the increase in ecig sales. While it could be a coincidence it would be a very brave regulator that would give no thought to the possibility that if we ban ecigs , it could have very serious unintended consequences. Addiction—or compulsive drug use despite harmful consequences—is characterized by an inability to stop using a drug; failure to meet work, social, or family obligations; and, sometimes (depending on the drug), tolerance and withdrawal. No tobacco use fully falls under this definition, more specifically the one most significant factor in addiction: social dysfunction. And because tobacco use, including smoking, does not cause social dysfunction, the incentive to quit completely is low, even when one is reducing life expectancy in the long-term. That is a serious issue, but in pales in comparison to a destructive meth habit. Tobacco cannot be called “addictive” next to drugs like heroin. […] Here’s the bottom line: We should not consider people who hold jobs, re-engage with their families, and regain control over their lives through treatment that uses medications to be addicted. Clearly, tobacco use does not fit Gottlieb’s terms here either. You could argue it does for smoking (and I would say it doesn’t, but that would send just about everyone running for the hills screaming), but it certainly excludes vaping, smokeless tobacco use, and even the average pipe/cigar smoker. Anyway, great article. Glad to see you’re on-board with teenage harm reduction, because true harm reduction embraces all. I think what is going on here is the stigma of ‘addiction’ that has been generated through decades of junkie imagery is being appropriated and applied to something much more innocuous. The emotive and stigmatising rhetoric of addiction has been mostly dropped in responsible professional discourse. That’s how we can tell this is a political, rather than regulatory, enterprise. Some notes & questions on 4 of the points. 2) The aspects of the definition of addiction. I can imagine some of the more nasty types in tobacco control thinking.. Although not explicitly and openly stated by the person in tobacco control, this (flawed & horrible) reasoning would completely explain their public comments. It is a result of TC types claiming to want to ‘make big tobacco scream’, when they in fact realize that the only means they have to achieve that is to convince the target consumer to stop buying the (tobacco) product. And once the pool of smokers who could be convinced to quit smoking for health reasons had been depleted (which it largely has) the only way they know how to do that is to keep smacking smokers (and now vapers) with a big stick. Vaping and other THR options might be viewed as a carrot. But that is not a tool that these people are either willing or equipped to wield. “a change in the way young people take marijuana.”? How? Is this from fees derived from MRTP / PMTA, a percentage of the TMSA funds, or by some other source? 13) It seems the very definition of ‘youth’ / ‘kids’ is a case of ‘(gradually) shifting the goal posts’. This (dripping with sarcasm) Tweet, posits that we might soon see even people 25(+) being thrown into the ‘youth’ category. this is not to say that what you do above is fantastic and very much appreciated. The FDA and Gottlieb have been bleating on about epidemics using past 30-day use from the latest data. Have they released daily use yet? I’ve not seen it, and I’d wager it doesn’t back up their position. No – daily use has not been disclosed. Also, smoking data has not been disclosed. The tobacco use patterns of the most frequent vapers have not been disclosed. All of these would be required to gain even a rudimentary picture of what is going on.